Since it's Super Bowl Sunday, a day I like to call the Wrestlemania of football, I thought I'd look at some of the past relationships between the NFL and pro wrestling. 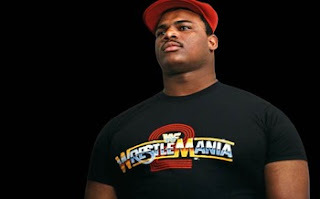 Wrestlemania 2: Probably one of the first major football/wrestling angles involved William "the Refrigerator" Perry and company in the Wrestlemania 2 battle royal. 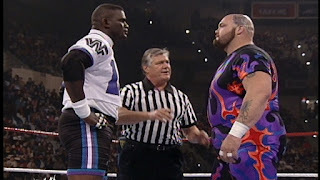 It pitted a group of players, (including Perry, Harvey Martin, Ernie Holmes, Bill Fralic, Russ Francis, and Jimbo Covert) against a variety of mid card WWF superstars (including the Killer Bees, Hart Foundation, and Bruno Sammartino) and the eventual winner of the event Andre the Giant. As a preteen at the time not and fulling understanding the workings of the business, I expected The Fridge to win this. After all, he was a Super Bowl champion, very popular, and the event was in Chicago. I was more than a little surprised to see him eliminated so soon in the match. Perry would eventual go on to be inducted into the WWE Hall of Fame (celebrity wing) over Wrestlemania 22 weekend in Chicago. I was there for the induction, as John Cena did the honors. I actually thought Cena's speech was pretty clever and entertaining. 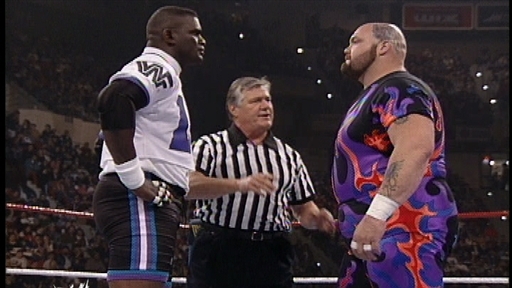 Wrestlemania 11: Unless I'm forgetting something, without a doubt the biggest NFL vs. Wrestling angle involved Lawrence Taylor and Bam Bam Bigelow. The two had gotten into an "altercation" at the 1995 Royal Rumble. Taylor was in the front row and mocked Bam Bam after his lose (I think) and Bigelow shoved the NFL great. That esclated and led us to a battle at Wrestlemania 11. The match was the last one on the card with Taylor going over. By this time, I was in college and had smartened up. But again, I was surprised to see the football player go over this time. Especially considering Vince would let his guys look bad against new comers from opposing companies. At least that seemed to be the mentality. I've mentioned before that I'm not a fan of "celebrity" wrestling appearances. But if they're done correctly it's okay. I think these two examples were fine. But when Steve "Mongo" McMichael got involved, that's where I wanted to beat my head against the wall. McMichael's involvement in wrestling started with the whole Taylor Bigelow match at Wrestlemania. If I remember correctly, he was in LT's corner with a handful of other players. Later that year, McMichael showed up as an announcer on WCW Monday Nitro. Listening to that man talk made me want to puncture my ear drums. 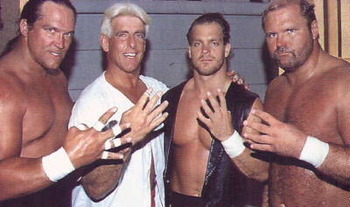 Then he transitioned into the ring and eventually became a member of the 4 Horsemen. I still maintain he's the least deserving member to ever enter that group. McMichael would also capture the WCW U.S. title. I think he might have won it a couple of times. But let me say that my dislike for him probably has nothing to do with him being a football player. I just thought he was horrible on the announcing. He was alright in the ring, nothing really stood out. So I guess I'll stop the bashing now. Kevin Greene also got involved in an angle with WCW and McMichael. The late, great Walter Payton was in Razor Ramon's corner one year at SummerSlam. And who can forget about PacMan Jones and his run as a coholder of the TNA tag team titles. So while you're cheering for the Packers or the Steelers today, just remember we're only 56 days away from Wrestlemania. Looking forward to it. Thanks for reading, and check out My 1-2-3 Cents on YouTube too. oh, it is real men! ...some of these juggernauts seem to be overweight!?!?! Thanks for bringing back some great memories!! !